Santa Bernadeta is an imaginary saint, whose creation was inspired by the magical blend of indigenous, religious, and colonial Spanish influences that uniquely defines Latin and South American culture. I invented Santa Bernadeta through my own photographs of the rich and diverse pictorial elements found in Puebla, Cuernavaca, and Taxco, the colonial heartland of Mexico. The text sprang solely from my own diabolical mind. This Digital Metaltype references the retablos, or retablos santos, tradition, a particular style of devotional painting found throughout Latin & South America, introduced into the area as a result of the Spanish conquest. Originally, only the wealthy could afford retablos, as they were painted on expensive substrates—canvas, wood or copper. By the early 1800s, however, cheaper tin-plated steel became widely available and retablos provided an affordable way for the masses to possess a sacred object that would ensure health, fertility, or general good luck. 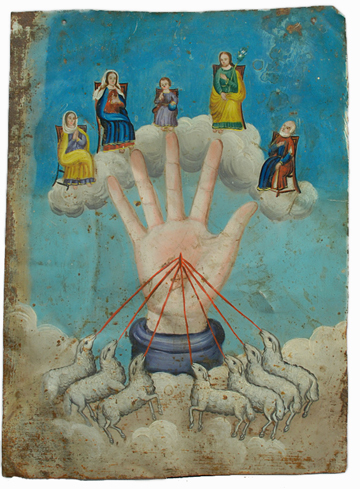 Today retablos are as much collected for their folk art properties as for their religious value. 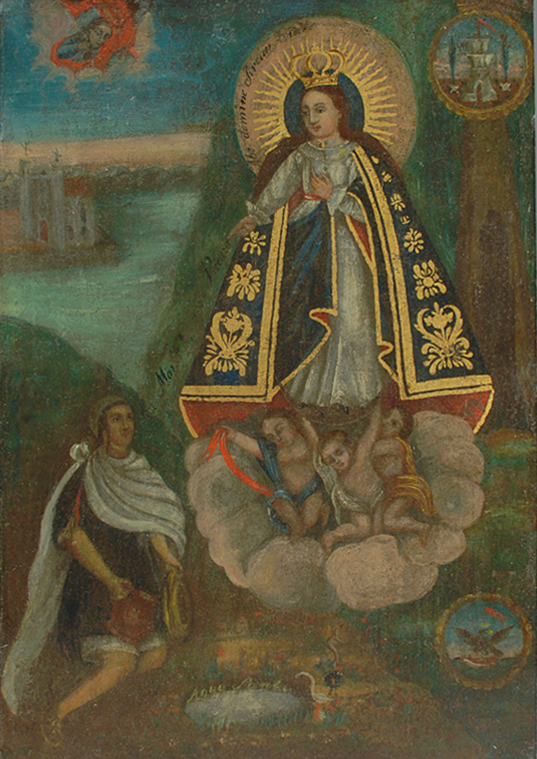 Executed largely by untrained artists, most retablos present an image of the saint or miracle accompanied by an explanatory text, which is often executed in child-like script. As a result, they have a naive and utterly-enchanting quality. When she was a young nun, Sister Bernadette was poor, humble and suffered from extreme emotional instability, although she had beautiful hair. Her life was a series of psychological crises. She prayed continually to Jesus, asking him to show her the way from physical pain & suffering. One night “el Señor” appeared to her and ordered her to stop thinking of herself and help others. After this vision, Sister Bernadette founded a hospital for the insane and dedicated her life to helping many people. Unfortunately, she herself was never cured, but she was canonized in 1986, becoming St. Bernadette of the Blessedly Insane.